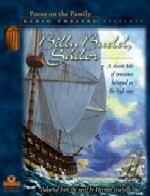 Herman Melville's classic seafaring tale Billy Budd, Sailor pits an evil officer against an innocent young sailor—and reveals the power of one person's example. In the British navy of the 1700s — with its legal kidnapping of men to serve on its ships — mutiny was a continual threat that was greatly feared by naval officers. Even minor offenses, regardless of guilt or innocence, had to be dealt with harshly to keep crews in their place. Against this backdrop, good and evil go head-to-head in Herman Melville’s “other classic,” pitting a cold-blooded, evil superior officer against the innocent goodness of a simple young sailor. The result is a cataclysmic event that leaves one man dead and another on trial for his life.